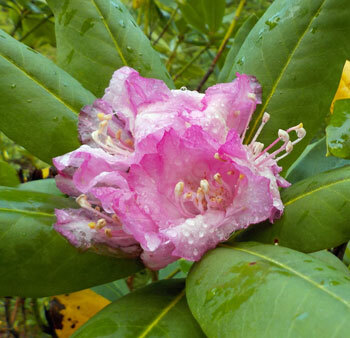 Wild Rhododendron Blossoms and More Mushrooms in December - what great holiday gifts! Can it really be true? It has to be, because we captured these lovely coastal rhodies in full bloom on December 3rd. The camera doesn't lie, and we don't either! We never cease to be amazed by the intensity of life around us. 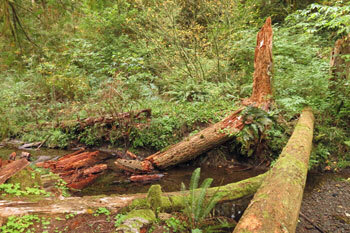 Ron LeValley of Fort Bragg, CA hails from just a ways south of our home near Port Orford on the southern Oregon coast. Ron is, quite simply, the best nature photographer I know. His knowledge of all kinds of things - birds, mammals, insects, and yes, mushrooms - borders on the encyclopedic. We own a few of his prints which decorate the walls of our home, and each day, we receive an e-mail from him with a nature photograph; many are spectacular. He offers this free daily service, which he calls "Outside My Window," to anyone who signs up for it, and I highly recommend it; for us, it's a highlight of each day, and we've learned a lot from it. A few days ago, his "Outside My Window" photo was especially unusual, as it featured a familiar mushroom (or, more properly, group of mushrooms) in a very unusual place: growing from a stump in the middle of a creek! He indicated that they were Honey Mushrooms, and the locale was Russian Gulch State Park in Mendocino County. Ron was using a Canon EOS 7D with Canon 28-135mm zoom lens. He says he's never seen anything like it, and neither have we! Oh, the last-of-the-year mushrooms are always so splendid! And, this simple recipe pays homage to them and to all the joys that this year's mushroom season has presented to us. mushrooming territory on Mt. Hood, is a quiet feast for the eyes!